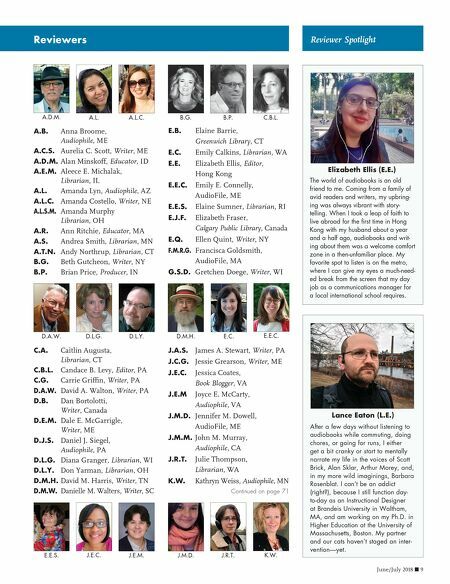 Contributors Jessie C. Grearson Jessie Grearson (Sunil Malhotra profile, page 58) is a freelance writer and a writing teacher living in Falmouth, Maine. A graduate of the Iowa Writers Workshop, she has co-authored two essay collections (Swaying: Essays on Intercultural Love and Love in a Global Village: A Celebration of Intercultural Families) published by the University of Iowa Press. She is currently at work on a practical handbook on college essay writing tentatively titled Irresistible You. When not writing, teaching, or coaching her high school speech team, she can be found visiting lighthouses, searching for sea glass, or in her kitchen garden, dreaming up new recipes. S.J. Henschel Contributing Editor S.J. (Sandi) Henschel (Jody Gehrman pro- file, page 26) is in her 17th year with AudioFile magazine. She has been a judge for the Audie Awards, interviewed some of her favorite narrators and authors, and listened to and reviewed a staggering number of audiobooks in that time. An NYC- trained actor, director, published poet (as Sandi Piccione), and playwright, Sandi reads selections from AudioFile magazine on Reachout Radio, a service for the blind and visually impaired. Her award-winning program is podcast and airs three times weekly on WXXI Public Radio in Rochester, NY. 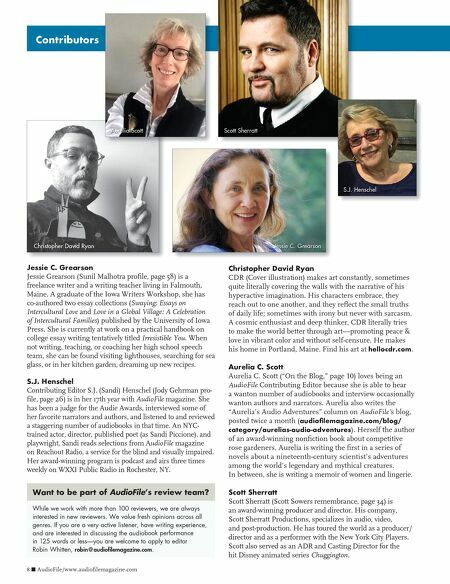 Christopher David Ryan Jessie C. Grearson 8 n AudioFile/www.audiofilemagazine.com Aurelia Scott Scott Sherratt S.J. Henschel While we work with more than 100 reviewers, we are always interested in new reviewers. We value fresh opinions across all genres. If you are a very active listener, have writing experience, and are interested in discussing the audiobook performance in 125 words or less—you are welcome to apply to editor Robin Whitten, robin@audiofilemagazine.com. Want to be part of AudioFile's review team? Christopher David Ryan CDR (Cover illustration) makes art constantly, sometimes quite literally covering the walls with the narrative of his hyperactive imagination. His characters embrace, they reach out to one another, and they reflect the small truths of daily life; sometimes with irony but never with sarcasm. A cosmic enthusiast and deep thinker, CDR literally tries to make the world better through art—promoting peace & love in vibrant color and without self-censure. He makes his home in Portland, Maine. Find his art at hellocdr.com. Aurelia C. Scott Aurelia C. Scott ("On the Blog," page 10) loves being an AudioFile Contributing Editor because she is able to hear a wanton number of audiobooks and interview occasionally wanton authors and narrators. Aurelia also writes the "Aurelia's Audio Adventures" column on AudioFile's blog, posted twice a month (audiofilemagazine.com/blog/ category/aurelias-audio-adventures). Herself the author of an award-winning nonfiction book about competitive rose gardeners, Aurelia is writing the first in a series of novels about a nineteenth-century scientist's adventures among the world's legendary and mythical creatures. In between, she is writing a memoir of women and lingerie. Scott Sherratt Scott Sherratt (Scott Sowers remembrance, page 34) is an award-winning producer and director. His company, Scott Sherratt Productions, specializes in audio, video, and post-production. He has toured the world as a producer/ director and as a performer with the New York City Players. Scott also served as an ADR and Casting Director for the hit Disney animated series Chuggington.